This is the second in this three part series. The first part covered the diving at Punta Perdiz, near Playa Giron in the Bay of Pigs. One of the nice things about a shore dive (see Cuban Honeymoon – Part 1: Diving the Bay of Pigs) is that your non-diving partner can sometimes join you. Or at least, for some of the dive. And so, as I had my first Cuban dive my wife had her first Cuban snorkel, but with all the time she wanted to explore the little coral formations in the bright sandy shallows. There is a good wide area in which to snorkel without having to share the same patch as bubbling divers. The vis is good enough that snorkelers should just about be able to see the main reef too, although you don’t need to go that far off-shore to enjoy yourself. Cayo Coco is east along the coast from the Hotel Playa Giron, but you have to reach it via the next junction from the main road through the village, turning left at the end. It is a lovely fine white sand beach with palm trees providing some shade from the intense sun. When we went in May it was a busy Sunday afternoon with locals and tourists cooling off in the breeze and the water. We found out later that it was Mother’s Day – the same date celebrated in the USA but different to the UK. Whether this meant it was livelier than usual I don’t know, but it made for good people-watching as the locals drank rum, turned up their stereos and had a family day out. There is a reef here that protects the shore from the waves. There are several ‘pathways’ through the sea grass to sheltered sandy patches, so it isn’t necessary to trash this important habitat on your way out. 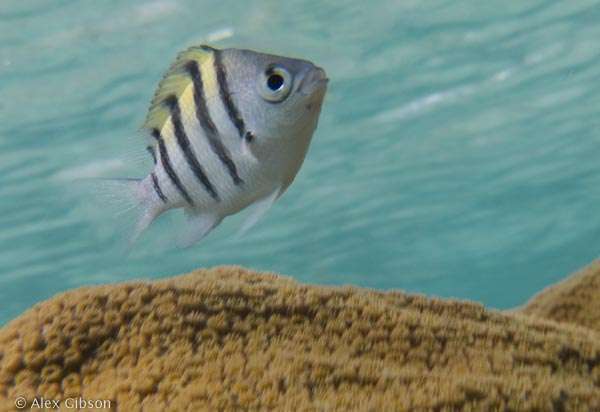 This is a nursery – juvenile reef fish dart in and out of the weed at the edges of the sand. A curious fish following me for several minutes, seemingly sheltering and occasionally darting at my camera lens. From its behaviour, I thought this might have been a juvenile yellowtail snapper, but as it didn’t have any yellow markings I am not so sure any more. This area is famous for the black and red land crabs which migrate in April/May each year to lay their eggs in the sea. But it was a different crab which caught my interest here. On the apparently barren sandy bottom there was a box crab – a crab with claws in such a shape that it can draw them in, turning itself into a rock/box. I only managed to get one shot in focus before it buried itself in the sand. Other highlights included seeing various fish grazing on the sea grass, a flat fish and a barracuda who stalked me for a bit. All just a few metres from the shore. As I mentioned in the previous part of this series, there are two well-known snorkelling spots on the tourist trail in the Bay of Pigs, neither of which we had time to visit. After leaving Playa Giron we continued to Trinidad, spending two nights there. We then went back to Havana to take our flight to Cayo Largo, which is the subject of the next part in this series.